Guinea pigs (Cavia porcellus) are neither pigs nor from Guinea, which is in west Africa. They are small rodents who originate from the Andes mountains in South America. There are several theories as to why Guinea pigs are so named. Some believe they’re called “pigs” due to the noises they make, their stout bodies and/or their resemblance to suckling pigs when they are cooked and served as food. Some sources say that when Spanish explorers brought Guinea pigs to Europe, they stopped at ports in Guyana in northeastern South America or in Guinea – both of which could have inspired the name. 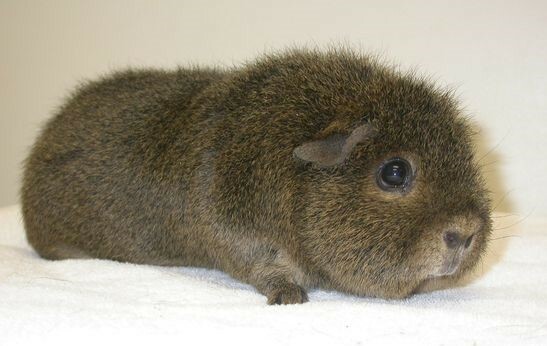 Guinea pigs are small and stout. They have very short legs and bodies that look like cylinders. Adults are typically between 8 and 10 inches (20-25 cms) in length, with females being a bit smaller than males. Guinea pigs have ears that are small and shaped like flower petals. While their snout is fairly prominent, they have very small triangular mouths. A strange myth states that if you pick up a guinea pig by his tail, then his eyeballs will fall out. Not only is the idea of this inhumane, but it’s also impossible as guinea pigs don’t have tails! The selective breeding of guinea pigs in captivity has resulted in many different fur texture, length and colours. The varieties of guinea pigs in captivity include the Peruvian, Abyssinian, English (or American), the Silkie, the Rex, the Teddy and the Himalayan. Some of these guinea pig breeds have long and silky fur; such as, the Peruvian and the Silkie. But other breeds have shorter and denser coats; such as the Rex and the Teddy. When we hear about scurvy, the images that often comes to mind are the seafarers of old. But did you know that guinea pigs can get scurvy too? One big difference between guinea pigs and other rodents is that they can’t produce vitamin C on their own and, like primates, need to get it from food and/or supplements. Guinea pigs are very social animals who generally need the company of at least one other guinea pig for the good of their mental health. In 2008, Switzerland passed a groundbreaking law that gives guinea pigs the official designation of “social species.” The law states that guinea pigs are considered abused if they are unable to regularly interact or live with other guinea pigs. Dogs are the most commonly thought of therapy animals, but did you know that guinea pigs are also used as therapy animals? A small study published last year in the Journal of Veterinary Behavior examined how being a therapy animal affected guinea pigs. Because of their gentle and social nature, guinea pigs are often classroom pets in schools – although there are mixed opinions on whether or not this is a good idea. Guinea pigs have an average lifespan in captivity of 5-6 years of age. Snowball is the oldest known guinea pig on record. The Guinness Book of World Records says Snowball died in February 1979 after reaching the age of 14 years, 10.5 months. Did you know that there are a couple of guinea pigs who are in the Guinness Book of Records? Truffles, a guinea pig in the UK, set a world record on April 6, 2012 for jumping a distance of 48 cms (1.5 feet). A guinea pig named Flash in the UK was crowned “World’s Fastest Guinea Pig” by the Guinness Book of Records for running 10 metres (32.8 feet) in just 8.81 seconds on July 27, 2009. This is the second time guinea pigs have been featured as our Animal of the Month. Check out our blog post from March 2014 to see our tweets about guinea pigs the first time around!